Previous story 7 Leg-Busting Tips from an Olympic Weightlifter Next story 60 Seconds to Fit - Is Traditional Bodybuilding-Style Training Outdated? Nothing beats arm day. Like our Sunday appointments with Homeland and Game of Thrones, we truly look forward to hitting our biceps and triceps. The skin-stretching pump and vascularity are immediate, visual indicators of a job well done. It should be noted, however, that the presence of a pump alone does not constitute the promise of growth. Training heavy will never go out of style, but when it comes to arm day, we (sometimes) smartly show restraint on load selection. A barbell curl where we sloppily swing the weight from A to B rarely does as much good as performing a rep precisely and with control. Adding weight in a safe manner allows us to build up our strength and heaps of dense, gravity-defeating muscle. Any good routine should include heavy and lighter work to target more total muscle fibers. Most routines begin with the barbell curl, but you may be able to place an even greater demand on your biceps by simply switching to the one-arm dumbbell curl. Studies show that unilateral training helps working muscles generate up to 20 percent more force than when training with the support of the other limb. This means that you can handle slightly greater loads, which can lead to more growth over time. In this routine, you’ll alternate between single-arm curls and single-arm lying extensions. You can self-spot with your free hand to muscle through an additional 2–3 reps on your last set or two. you to take advantage of the agonist-antagonist relationship between muscles around a joint. Research shows that a muscle is stronger when trained immediately after its antagonist (opposing) is hit. But we haven’t forgotten the finishers. Doing some higher-rep work at the end of your workout—in this case, the Tabata method—brings tons of blood to working muscles, and the nutrients that make them grow. 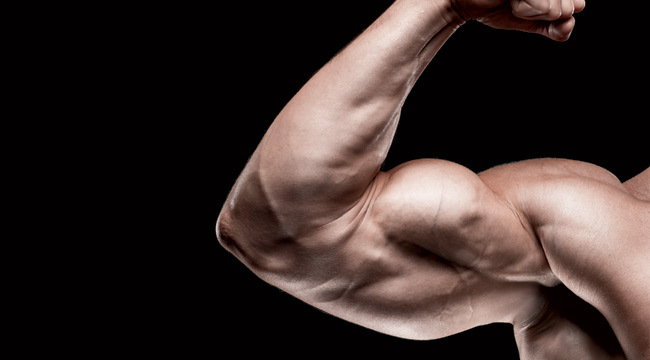 Continuous Motion Mass Building: The biceps and triceps are smaller muscles that recover fairly quickly between sets. On your first two moves, because you are training only one side at a time, you can skip the rest period. Tabata: Tabata calls for you to perform eight, 20-second segments of work, each followed by 10 seconds of rest. Select a weight that you can handle for 12–15 reps and use the same weight throughout. Your reps will likely decrease in each work segment. If you can still perform 10 reps by the eighth segment, you should go heavier the next time. *Use your free hand to get through 2–3 extra reps after reaching failure on your last 1–2 sets. **Perform curls on each side before moving on to lying extensions. Start your extensions on the same side as you did with curls to ensure recovery. Do not rest between supersets.